A new total of 13 dead horses had to be buried, including carcasses that had been picked clean by scavengers, and the body of one that was at the edge of a shallow pond – the only water source for the animals. When Scott and LaNise Kirk went to scope out a property they heard might be for sale in Roodhouse, Illinois, instead of finding attractive green pastures they stumbled across a horror scene. They discovered nine dead horses that day, and others in a serious state of health living in awful conditions. 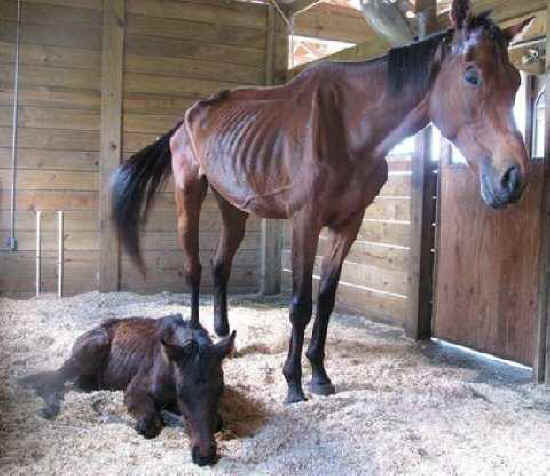 “If there is such a thing as a concentration camp for horses, that was it,” LaNise Kirk told MyJournalCourier.com. The Kirks wasted no time in trying to help the surviving horses – they contacted Steve Alexander of the Central Illinois Horde Rescue Society on Feb 22nd, who in turn contacted Stacy Ballard, an investigator with the Illinois Department of Agriculture. However despite visits from both Alexander and Ballard, nothing was done immediately to help the horses. "No vet came to check the living horses on site to determine if any had to be euthanized and which could be seized and taken to others to nurse back to health. And every day, more horses were dying," LaNise Kirk said. On the 27th February, the Kirks returned to the property and found another two horses had died. They also took feed for the horses living outside, but were unable to access others who were in a locked barn. "Steve Alexander told us that he put up citations that gave the owner ... 48 hours to bury the dead horses and get a vet out there to examine them," LaNise Kirk said. "We told Steve we were willing to take some of the horses to foster, but again, nothing happened." The alleged owner of the horses, Stacy Kempf, contacted a neighbor on February 28th to ask for two large bales of hay for the animals. Churchill went round to the property as asked, but was totally unprepared for what he saw. A new total of 13 dead horses had to be buried, including carcasses that had been picked clean by scavengers, and the body of one that was at the edge of a shallow pond – the only water source for the animals. Both the owner and the Department of Agriculture investigator were there when Churchill started burying the horses. Following a two week investigation, a warrant was issued for Kempf’s arrest, citing nine counts of violating the Illinois Dead Animal Disposal Act, nine counts of cruel treatment of an animal, and 12 counts of violating owner duties. Kempf turned herself in and her court date is April 4th, where it is expected that she will receive a sentence of up to a year, probation or a fine. She has since turned the surviving horses over to the Steve Alexander at the Central Illinois Horse Rescue who has already begun caring and finding homes for them. An ‘Animal Rights Rally’ has been organized for the day that Kempf attends her court hearing, and will be attended by the Kirks and local media.